From Butler – go north on US Highway 71 to Passaic. Go east from Passaic on County Highway D for 12 miles, then go south on County Highway BB ½ mile. It is on the east side of the road. The Antioch Church of United Baptists was constituted in Bates Co., Missouri on “Saturday before the first Lord's day in November 1867” (2 November). The Rev. Lewis McComb gave the land for a church and enough land to the east of the church for a cemetery. 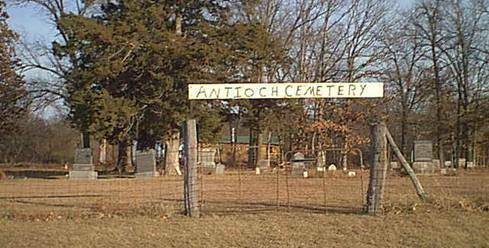 The cemetery adjoins the churchyard of the Antioch Baptist Church which no longer stands. Currently, the cemetery is being maintained courtesy of Ross and Wanda Wainscott family. Donations to help with cost of gasoline for mowers is appreciated as they receive no funds from the cemetery for their work.